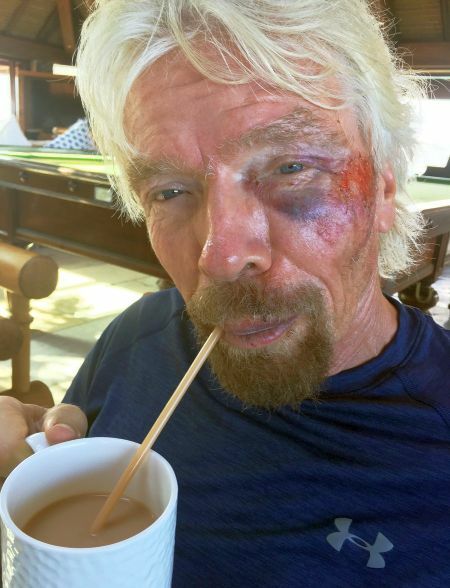 Sir Richard Branson, Virgin founder and Britain’s best known businessman on Friday said that he thought he was “going to die” after an horrific bike crash on the Caribbean island Virgin Gorda this week. Branson was cycling with his two children on the British Virgin Islands when he hit a hump in the road. In a post on the Virgin website, the 66-year-old entrepreneur said, “I was heading down a hill towards Leverick Bay when it suddenly got really dark and I managed to hit a sleeping policeman hump in the road head on. “I really thought I was going to die. I went flying head-first towards the concrete road, but fortunately my shoulder and cheek took the brunt of the impact, and I was wearing a helmet that saved my life. His assistant was the first to arrive on the scene followed by another member of his team who sprinted up the hill. They took him home and patched him up before he flew to Miami for scans. Branson said it was one of many brushes with death he has had over the years. These include being rescued along with other crew members from his capsized speedboat when attempting the fastest-ever Atlantic crossing in 1985. Two years later he ended up in the sea again when forced to abandon his hot air balloon while attempting the first transatlantic crossing in a balloon.